Top left to bottom right is how it’s made and how we’ve eaten it over the course of a few days. I like a nice slab of meat with potatoes and other vegetables. So a Sunday roadt seemed like a good way to start off this food year. I began by first washing the beef off with some cold water than put salt, black pepper, thyme and rosemary on the beef and rubbed each side to let the flavors set. Then I fried it on high in a frying pan with a lot of butter and a couple of crushed cloves of garlic to let the meat get some color and to release some flavors. After which I put it in an ovenproof dish with the vegetables. We had potatoes (two kinds), carrots and red onions for a side dish. I just chopped the vegetables in big chunks and mixed them with some salt, pepper, rosemary, thyme and a few cloves of crushed garlic. When the meat was in the ovenproof dish I poured over the vegetable mix and put it in the oven at 175 degrees celsius for an hour. After an hour I made a stock containing two lamb flavored stock cubes, some black pepper and 3-4 bay leafs. I let that come to a boil before pouring it over the meat and vegetables and put the dish back into the oven for another hour. I had to keep the meat in there for that long due to not being allowed to eat meat that’s not cooked all the way through but I suggest that you take the meat out after a half hour the second time in the oven. When all was done I let the meat rest while I made a sauce with the stock that was in the dish. I reduced it on the stove with some Japanese soy and some mustard. Yesterday we had roast leftovers and we made a tzatziki inspired salad with two carrots, 3/4 of a cucumber, 5 cloves of garlic, loads of salt and black pepper and sour milk. Some prefer yoghurt but I find it too creamy. And with that some boiled potatoes. 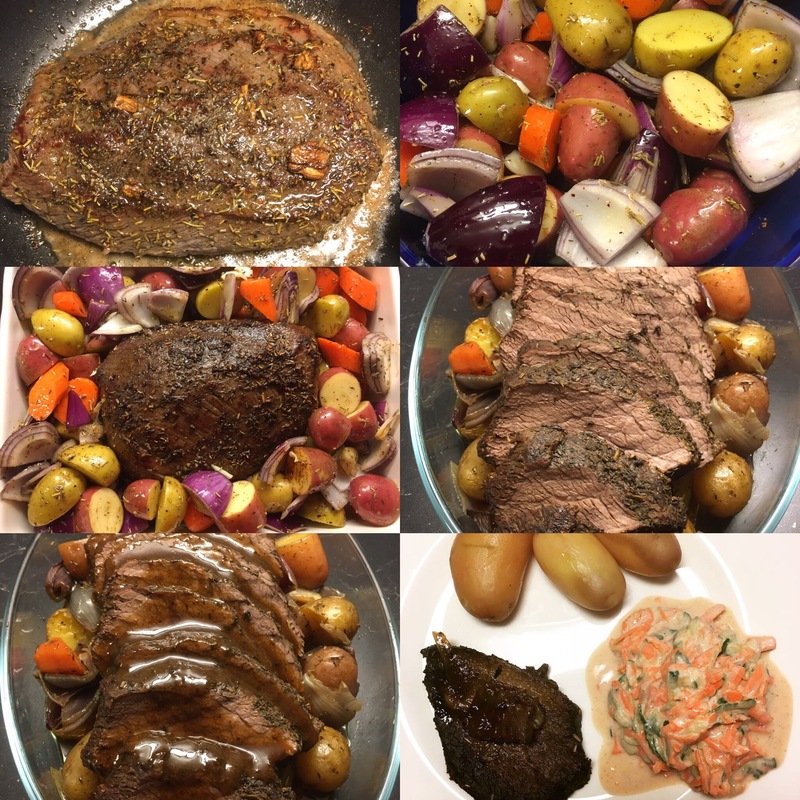 Let me know if you make roasts how you season and tweak them!